Be the first to share your favorite memory, photo or story of Barbara Lou. This memorial page is dedicated for family, friends and future generations to celebrate the life of their loved one. 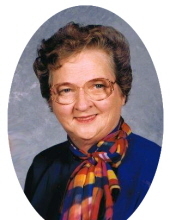 Barbara Lou Stevenson Hart, age 80, of Mt. Sterling, passed away Saturday, March 16, 2019, at Windsor Care Center from heart failure and Alzheimer’s disease. She is survived by her loving and devoted husband of almost 63 years, Roger Hart. Also surviving are two wonderful sons, Gregory Hart (Mary) of Mt. Sterling, Darin Hart (Julie) of Falmouth; four very special grandchildren, Alicia Renee Price (Will) of Mt. Sterling, Andrew James Hart (Katelyn) of Morgantown, Haley Ann Slover (Daniel) of Falmouth and Holley Ann Hart of Falmouth; one brother, Bush Stevenson (Dyan) of Mt. Sterling; one sister, Judy Curtis (Frank) of Mt. Sterling; and a host of extended family and friends. Barbara was a faithful lifelong member of First Church of God serving in numerous activities and departments throughout the church. She loved gospel music and was out of a very musical family (the Stone family). It was one of her greatest joys when the family came to her house for fun and music. She will be greatly missed by her church family and friends. Barbara with her dear friend, classmate, and business partner, Laverna Grayson were professional interior decorators. They hung wallpaper and all-related decorating procedures for over 30 years in Mt. Sterling and all surrounding counties. They decorated everything from doll houses to multi-million-dollar homes and businesses. Barbara, husband Roger, two sons Greg and Darin, and grandson Andrew lived on and operated the family’s cattle and tobacco farm most of their life. She loved her work. Barbara’s house was the place to go for all the parties and holiday entertainment. She loved having all the family, friends, and had an open door to anyone who wanted to eat, party, and sleep over. Her home served as a sanctuary for a friend or family who had a problem or needed help. She was recognized publicly for her lavish Christmas tree displays where she would put up and decorate 18 to 20 full-size Christmas trees every year, plus all the regular table displays all over the house (three floors). She with all her family supplied food and would prepare enough food and party supplies to last several days. She could not have done it without the help of her sister, Judy; her granddaughters, Alicia, Haley, Holley; in-laws, Mary and Julie Hart; and a lot of the other lady members of the family; and the guys, too. A lot of grown adults still recall all the fond, happy memories of coming to Barbara’s house as children. Barbara and Roger provided a home base through the years for special events and activities. They were married for almost 63 years and both have said on numerous occasions they would love to do it all over again; no regrets ever, all due to having such a wonderful marriage, family, and home all those years. Roger and kids have lost one of their most precious earthly possessions, but Heaven has welcomed and gained a prized member to its eternal Heavenly Home. Funeral services will be conducted 11 a.m. Tuesday, March 19, 2019, at the First Church of God with the Rev. Frank Curtis and the Rev. Bush Stevenson officiating. Burial will follow in Machpelah Cemetery. Pallbearers: Larry Goldie, Carl Hartgrove, Brent Risner, Damon Curtis, Derrick Curtis, Bryan Stevenson. Honorary Pallbearers: Helen Goldie, Louise Shoemaker, Laverna Grayson, Mary Tom Ensor, Shannon Hartgrove, Ronnie Donaldson, Bobby Reeves. Visitation will be 5 p.m. to 8 p.m. Monday, March 18, 2019, at the Mt. Sterling First Church of God, 1051 Camargo Road, Mt. Sterling, KY 40353. To send flowers or a remembrance gift to the family of Barbara Lou Stevenson Hart, please visit our Tribute Store. "Email Address" would like to share the life celebration of Barbara Lou Stevenson Hart. Click on the "link" to go to share a favorite memory or leave a condolence message for the family.